Federal Criminal Background Check reports will show if applicant has had any criminal cases filed against them that violated federal criminal law. It is a search of a specific federal district court’s records. Federal cases include crimes involving federal law, crimes that cross state boundaries, and crimes that are committed on federal property. Report turnaround times typically are within 24 hours. This report returns records stored at the Federal District Court level and may include charges and convictions, case number, file dates, disposition, and / or current status. Information required for federal criminal background checks includes: name, date of birth, Social Security Number and the Federal Court District(s) to be searched. In most cases results will also include docket proceedings. This report will include cases up to 10 years (unless otherwise prohibited by state limitation). Information in this report is not contained in any county or state searches. 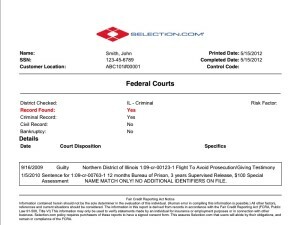 Click here for a federal criminal background check sample. Click here for a full description of the federal criminal background check report.